Brass jags are sized to fit each caliber of a firearm. The jag is shaped like a plunger with a pointed tip that will hold a cleaning patch securely. When matched with a patch, the jag will fit tightly in the bore, and this pressure will help remove fouling along with excess solvent and oil. A fouled bore can be cleaned using just a jag and patches along with a high-quality bore cleaner. Make sure the firearm is unloaded before beginning to clean it. Remove all ammunition from firearm and physically inspect chamber and magazine to ensure firearm is unloaded. Failure to do this can lead to injury and loss of life. Remove bolt or open the action to facilitate the cleaning. 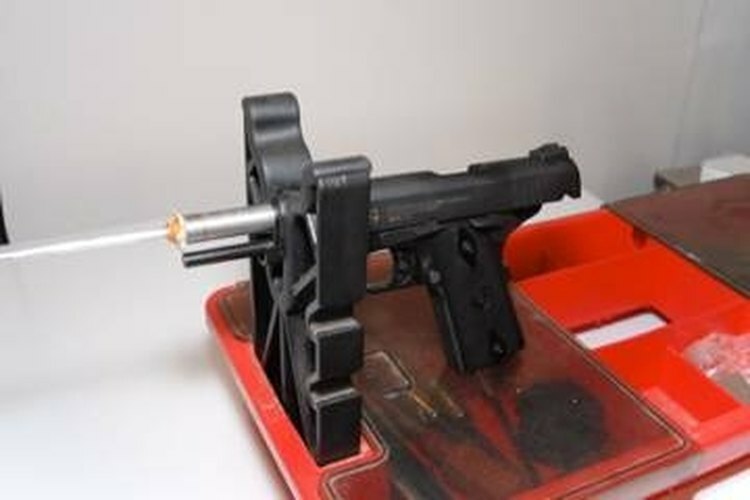 Clean the firearm from the breech, if possible, to prevent damaging the rifling on the muzzle. Attach the appropriate-sized jag for the pistol's or rifle's caliber to the cleaning rod. Open the lid to the cleaning solvent and saturate a cleaning patch with the solvent. Run the solvent-soaked patch down the barrel and remove patch from jag when it clears the muzzle. Let the solvent soak in the barrel for several minutes to loosen and start removing the fouling. Remove the jag and run a solvent-soaked bore brush down the barrel several times to remove the fouling. Reinstall jag back on the cleaning rod and run another solvent-soaked patch down the bore. Repeat several times until the patches start coming out clean. Run several dry patches down the bore to remove any excess solvent. Lubricate a patch with gun oil and run this down the barrel, which will leave a light coating of oil on the bore. Inspect barrel to ensure there are no obstructions, and then reinstall bolt or close chamber. Clean cleaning equipment to remove all bore fouling and solvent. Lubricate exterior of firearm to prevent rust. See the Resources section below for a link on where to find brass jags for sale. Follow manufacturer's recommendations for solvent and oil. Safety is the number one concern. Be sure firearm is unloaded and pointing in a safe direction. Wear safety glasses, and use solvent in a well-ventilated area.